The Tilda enables the seat to be tilted to 15 degrees using 3 motions. There is an easy to use handle on the side of the unit that allows the occupant or carer to tilt the seat. When used in combination with the Carony wheelchair transfer system and the Turny Evo or Turnout, this product improves the head space when entering the vehicle. 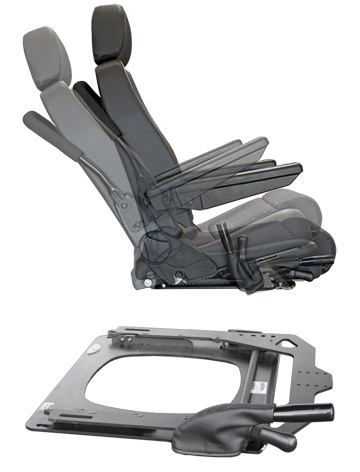 The first position of the Tilda has been crash tested, allowing you to travel in a safe and comfortable position when in the vehicle and can help improve head stability for those with limited neck strength. There is also an optional footrest that when used with a swivel base allows you to get your feet over the door frame easily and inside the vehicle.